The physical and the digital worlds couldn’t be more separate. Though many people would argue that in an age of cellphones and social media, we live more in the digital world than the physical, the second the power goes out or the batteries die, all doubt is rescinded. Still, the fantasy of mixing the digital and physical realms permeates our books, films, and televisions. Think about it; The Matrix, Ready Player One, and the ever poignant Black Mirror all encapsulate this melding of real and fantasy in a way that people connect with. Board games have always been contrasted heavily with video games since they share so many commonalities. 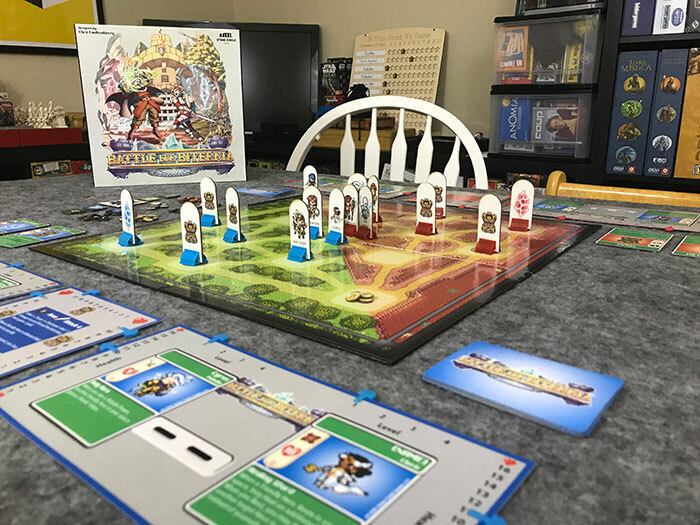 With so many digital versions of popular tabletop games being released and more apps being integrated within physical board games, it seems that our mixed reality fantasy has even begun to invade our beloved hobby. How this trend will grow, I’m not quite sure. What I do know is that this doesn’t seem to be a trend that is slowing down. While there are no fancy apps or digital implementations in today’s review, we’re going to take a look at what it might look like to really embody the feel and spirit of a specific kind of video game into a physical presence. Let’s take a look at Battle for Biternia. 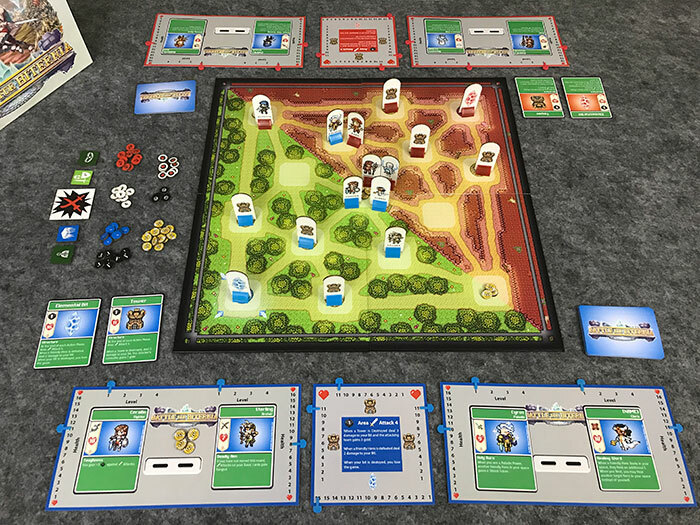 At its core, Battle for Biternia is attempt to take the sub-genre of video games called “MOBA” and turn it into a board game. If you’re not familiar, MOBA stands for Multiplayer Online Battle Arena. In these games, two teams play in a real time, head to head, arena where they try to destroy the other team’s base. Each team member gets to pick a unique character that plays differently than all of the rest. Both teams try to outplay the other team by defeating their characters and turrets (which block the paths) and outpacing them in leveling up their characters up. The more characters they destroy, the quicker they get to level up and get new abilities and items. The most common MOBAs you’ll see out there are games like League of Legends, Dota 2, and Heroes of the storm. 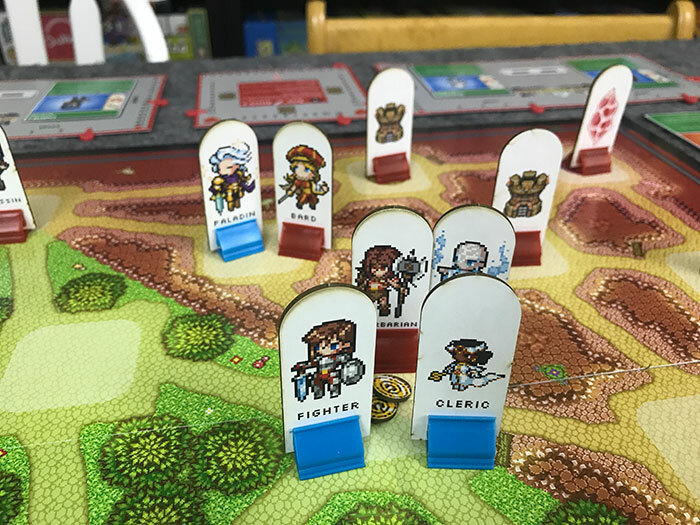 In Battle for Biternia, both players start by drafting their four characters and then take turns placing them in one of the starting spaces touching their base. Each character has a special set of cards that only they can use, and so each player gets to pick one for each character to start with. After picking their character specific cards, they draw the rest of their hand from their deck of generic cards that can be used by any character. 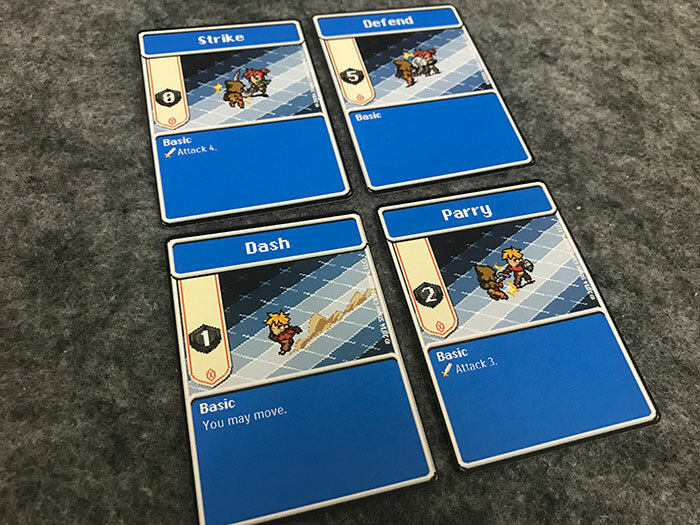 Orders: Players simultaneously choose an action card to play for each hero and place it face down on their character card. Movement: Players take turn moving their characters one space each. Action: Players take turns activating action cards for each hero, one at a time. Cleanup: Players gain some gold and can spend some gold to level up any living heroes. They then discard as many cards from their hand as they choose and draw back up to eight. The first player token passes and a new round begins. Most of Battle for Bitternia’s interactions are tied to the action cards. Each player starts out with the same starter deck of generic common moves (parry, run, defend, etc.) and one special move for each hero. The special moves come in a wide variety, but always play off of the theme of the hero (for instance, the ice mage has a blizzard spell). Once a card is played, the previously played card for that hero is discarded and the new one replaces it. The defense value of the current face up card is always what is used to show the number of points of damage that are blocked from opponents attacks. For the most part, most of the abilities will be used immediately when played, but some require the hero to “channel” them until the end of the turn in order to activate. 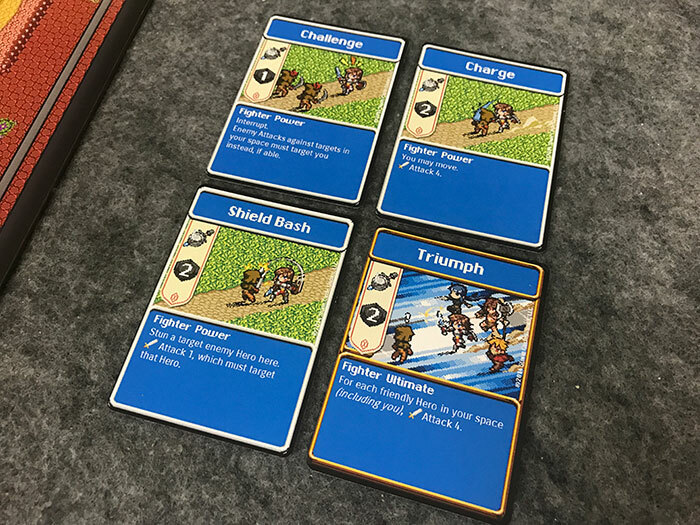 Action cards that are used to attack will have a distinction between whether they are ranged or melee actions and then will denote how much damage they do. Action cards that are defensive will usually have some kind of special ability or a temporary defence boost. These cards can also be played and discarded to do alternate actions like farming gold (gaining one gold plus any bonuses on the board) or healing health. These can be extremely helpful actions, but that hero is not able to attack that turn and must also discard his face up defense card. 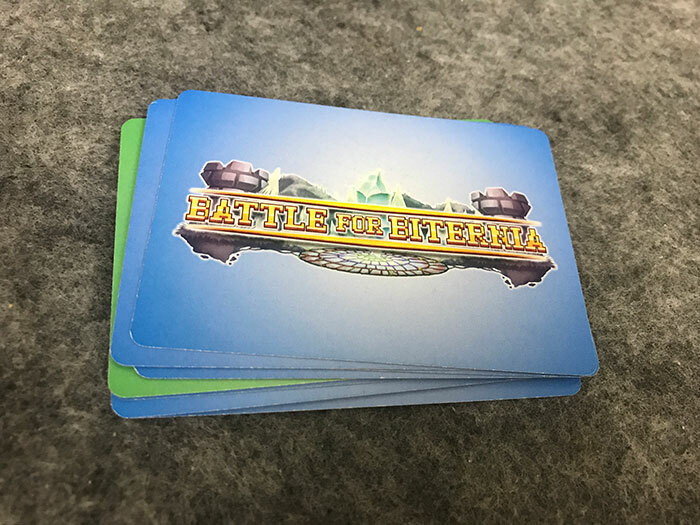 Battle for Bitternia is largely based off of these action cards, which means that there is little to no randomness. As you progress through the game, you will have the option of gaining more specific cards for each character, including an ultimate ability, by “leveling up” a hero at the end of the round. For each hero you can pay gold equal to the new level, take one of the four special ability cards from their stack, and put it into your hand. Just like other cards, these will be discarded when used, but will eventually make it back into your hand. 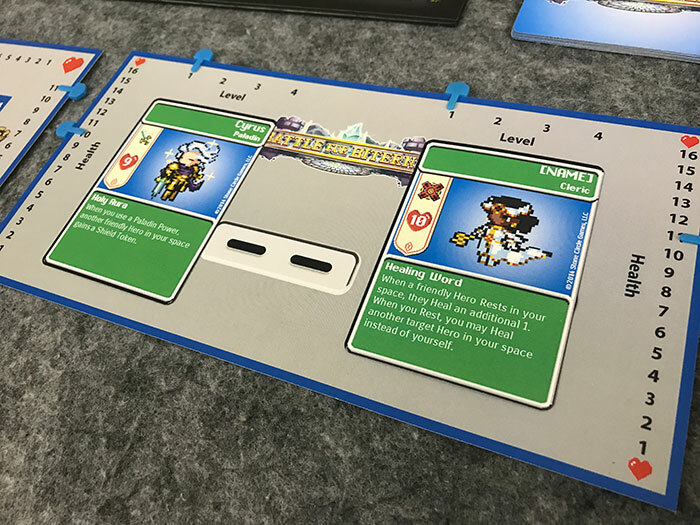 Upon reaching level 4, the player can take the heroes extremely powerful “ultimate card”, which is specific to the hero. One interesting note about this game is that when cards are discarded from play and put into the discard pile, they must stay in the same order at all times. This means that when you run out of cards, you flip your discard pile directly over and begin to draw from it. Because of this interesting rule, you should have a good idea when your cards will be coming back to you. In addition, when a hero dies, their card is discarded and redrawn in the same manner. Since hero cards have a different color back, you will be able to tell about when you will draw it again and can replay them. Overall, the game is pretty straightforward. You pick and action for each character, move them around the board, activate them, and do it all again. So, let’s take a look at what makes this game so interesting. So much of this game relies on trying to anticipate what your opponent is going to do and then either avoiding it or counteracting it. There are so many interesting decisions that can be made based on the timing of how things happen. For example, when you’re taking turns revealing and executing the action cards, you may want to attack a specific hero before they flip over a card and gain some defence, or maybe you want to activate one of your heroes before your opponent can attack you so that you can gain some defence. Either way, you’ll want to do more than you can do in one turn and might have to risk one opportunity for another. The timing of trying to push your luck while trying to get as much done in one turn as possible is hard, but the challenge is what makes it so good. The same concept carries over with movement. Both players will want to save their most important movements until the end because they don’t want to give the other player too much information. If they move one of their attackers into an opponent’s space to prepare for a big attack, that opponent might get the chance to move out of that space if the first player moved too quickly. Since so much of the game is based on reacting to the opponent’s move, there really is this sense of always trying to actively guess their turn. This aspect resembles MOBAs very well since you also are always reacting and taking counter measures against the opponent’s moves. So, the big question is, how well does this game incorporate the feel of playing a MOBA into a tactile board game? Obviously, not everything will translate one to one, but Stone Circle Games did a great job getting the “feel” down, first and foremost. If you’re familiar with the genre, you might notice that there are only heroes and no minions (little automated characters that automatically spawn to protect each team’s towers). This might seem like an oversight, but I think it really keeps the game from getting bogged down with tons of unnecessary bits and mechanics. It seems like this game was designed with the idea of finding the core concepts that make a MOBA feel like a MOBA and translating them into mechanics that make sense on a physical board. One of the best examples of this translation is the way that cards and heroes are discarded. In a game like League of Legends, every time you use a special ability (which are unique to the hero), it triggers a “cooldown.” That just means that there will be a specific amount of time that has to pass until it can be used again. (Often this is shown by a little timer over the ability icon.) Battle for Biternia recreates this by having you draw your deck in the same order that you discarded it. If you play an action card, you should have a pretty good idea when you’ll be able to draw it. The same concept goes with heroes who die, except you know exactly when you will draw them due to their different colored card back. Furthermore, the farther you get into a round in a MOBA, usually your character’s respawn time will increase. In Bitternia, the farther you get, the more cards your deck has, and the longer it will take to respawn a specific character. Battle for Biternia is an interesting game. At times I found myself frustrated with some things here and there, but overall, the way that the game emulated a full featured MOBA really grabbed me. That doesn’t mean that it’s faults are not noticeable. When playing against a good player, the game can feel very punishing. Sometimes you’ll plan out an awesome move and then completely miss because your opponent blocked it. Sometimes you plan to use your awesome ultimate kill and your opponent kills you the turn before you play it. Things like this can be harsh, but you’ll also learn from them. Oddly enough, this also feels like it emulates the digital genre. In addition to those small things, I did find a few confusing rules here and there. I don’t think the rulebook was laid out in a way that really helped too much when it came to these fringe cases, but it got the job done well enough. The trick is that this game is simple enough that when a confusing or complex situation happens, you can usually figure out a solution pretty easily. I enjoyed my time with Battle for Biternia for sure. Still, I’m curious to know how much my experience with games like League of Legends and Dota 2 impacted my games. I really think that someone who has never played this genre before can still pick it up and enjoy it, but they certainly will not understand and appreciate the subtleties in the game mechanics that make this feel right. If you like MOBAs, you’ll probably enjoy this one. If you’ve never played one, don’t count it out and give it a shot! 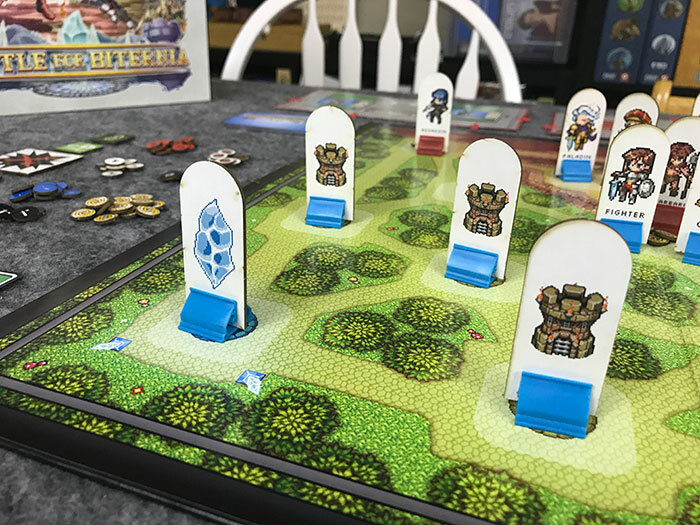 Be sure to check out Battle for Biternia on Kickstarter now! What do you think about Battle for Biternia? Give us your opinions about what you like and/or dislike about the game in the comments below!